If I should pick my favourite city in Chile, it definitely wouldn't be Arica, but if I should pick the most beautiful ocean coast, then Arica is without doubts sitting on the first spots. Just 12 km from the Arica city centre is a geological wonder called Cuevas de Anzota, the main reason we have arrived at this city in north Chile. Brutal ocean waves crashing onto the black rocks on the coast of north Chile gave origin to a beautiful rock formation now called Cuevas de Anza. A place which 10 thousand years ago was home to the Chinchorro culture, one of the first South American culture, is now a popular tourist spot in Arica. With new coastal walk with staircases into the caves and viewpoints, Cuevas de Anzota was a destination in north Chile we couldn’t miss to see. At the end of the biking suffering though, there was a path through the coastal caves waiting for us, so definitely a great reward! There wass also a parking place and a gurad, so we have parked our bikes and continued on foot. In 2016, the municipality has built a beautiful coastal walk passing these caves, with info boards where you can read a bit about the history and origin of this place. Besides history, they also make up stories about the rocks, for example, the one bellow should reminiscent the head of the pterosaur, maybe because caves were created in the Jurassic times. The coastal walk is really nice and undemanding with only a few kilometres of almost narrow nice terrain. It passes several viewpoints, tunnels and also one huge cave with an amazing view out at the ocean. These caves were also home to Chinchorro people, fishermen culture who used them as shelters and are famous as one of the first cultures, which used mummification for burying their deaths – some mummies can be also seen in a small museum nearby Arica (mummy museum in Azapa). 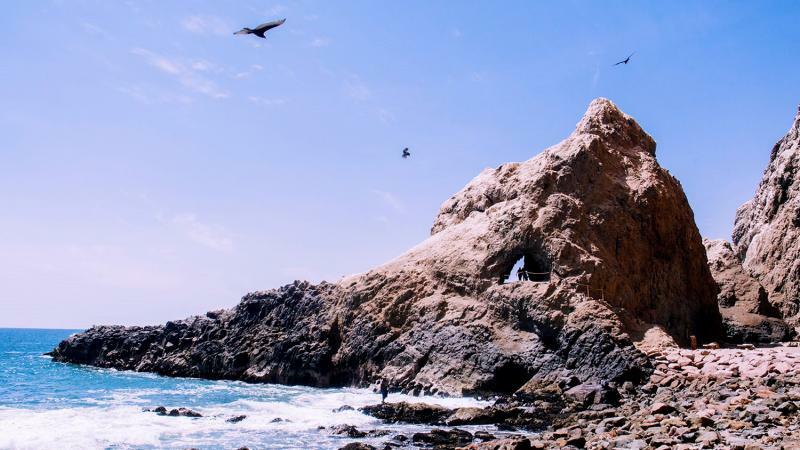 Although Cuevas de Anzota where the main reason we've visited in Arica, there are also other things to do in Arica, which are worth spending a few more days in north Chile. The Arica city centre has a nice promenade surrounded by shops, restaurants and bars and is the best place where to go for some seafood for lunch or dinner. My favourite part of the city is through the area between the beach, Plaza Colon and the El Morro mountain, with a beautiful San Marco cathedral and small cafes to sit down and watch people passing by. Quite often, there are also events and happenings in this area. Right before we left Arica, we drove up to the El Morro Mountain, which is overlooking the whole city centre, the ocean and the road towards Cuevas de Anzota. Besides having an opportunity to watch surfers trying to practice for the El Gringo wave, there is also a weapon museum which was especially interesting for Primoz. El Moro was an important strategic spot during the Pacific war and has now a display of canons from that area and other weapons from the war. Though Chilean beaches cannot be compared to the beaches in Brazil, if you make it to this side of South America and wish for some beach time, the sandy beaches of Arica are a great place to be. There are several beaches lining the coast of the city, my favourite one was though Playa El Laucho south of the Arica city centre. There is a nice promenade with painted concrete columns leading to this beach, which makes for a great walk and a great photo opportunity. Arica is also part of the World Surf Cities Network, an international group that brings together the most important destinations related to surfing. Several times a year it hosts international tournaments where people come and try to ride the 5m tall wave El Gringo, the most famous wave in Chile. Though El Gringo is challenging even for experienced surfers, several surf schools in Arica make sure even beginners have their surf ready to hit the easier waves. Although the National Park Lauca is a good 3 hours drive from Arica, where you rise from 0 to 3000 m above the sea level, if you are visiting Arica, you definitely shouldn’t miss this mountain trip. National park Lauca lies at the very borders with Bolivia and Peru and is a great representative of the Quechan Andean culture. It’s not as a popular spot for hiking as are other Chilean National parks, especially those in the south, but it has some amazing places worth visiting.